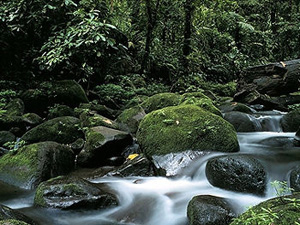 New research suggests that the Amazon Basin, pictured here, emits significantly more methane than previously thought. For a long time, people have recognized that the Amazon Basin is a significant source of methane, says John Miller, a research scientist at the NOAA Earth System Research Laboratory in Boulder, Colo. New research, however, is showing that the Amazon Basin is actually emitting substantially higher volumes of methane than previously estimated. Considering methane is 21 times stronger as a greenhouse gas than carbon dioxide, researchers say, getting a handle on just how much methane is being emitted into the atmosphere is important. From 2000 to 2003, Miller and his colleagues measured methane content over two sites in the central Amazon Basin at various altitudes during both the wet and dry seasons. From the surface to about four kilometers (about 2.5 miles) high, the team found between 34 and 200 parts per billion more methane than other measurements had shown over the basin, they reported May 25 in Geophysical Research Letters. "The fluxes that we estimate are substantially larger than what others have shown," Miller says: "The Amazon is even more important than we previously thought." Miller's team also investigated the source of the methane. Much of the Amazon Basin is wetlands, which are the single most significant source of atmospheric methane globally. But the Amazon is also filled with trees and plants, which recent research has suggested also emit a lot of methane (see Geotimes online, Web Extra, Jan. 13, 2006). Miller says that neither plant emissions nor wetland emissions by themselves can explain the high methane emissions the team observed, but, he says, "if I had to guess, I'd say wetlands come closer" to explaining the volumes. Differentiating various sources of methane emissions is difficult, but can be done, he says, as isotopic ratios can separate emissions from wetlands, coal mines, biomass burning, animals and fossil fuel use. But separating wetlands from plant emissions is "extraordinarily difficult" he says, as any difference in the isotopic ratio would be "very, very small." Then there is the question of whether or not plants actually emit methane: A new study published April 27 in New Phytologist online suggests that there is no evidence that plants emit a substantial amount of methane. "More laboratory and field studies would definitely help," Miller says. "I don't think anyone would claim to have the whole atmospheric methane picture solved," Miller says. "With each new study or sampling project, we learn more and more about what's really going on" in the atmospheric methane budget, he says.